New 2018, the oval plus series now introduces a smaller 12 Litre size autobin that's great for smaller rooms such as bathrooms, bedrooms, children's playroom and home office. This slimline model snuggles into the most environment with its elegant and sleek looks. Over time, Autobin has proven that all of their products are always perfectly designed and engineered for life to become more manageable and neater thanks to its innovative patent. It doesn't matter if your house is big or small, your sensor bin was designed to perfectly fit in any room in the home such as the kitchen, bathroom, bedroom, children's room, Living room and or even in the motorhome such as caravans!. 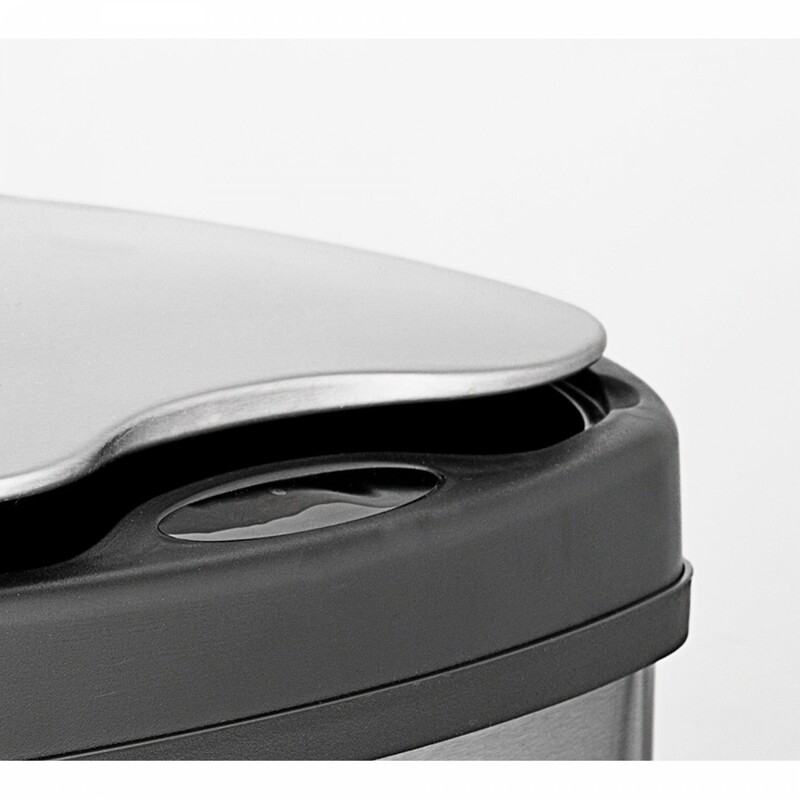 Our new 12L model is slimline, made from the best grade of stainless steel that is durable and features all of the most advanced technologies that can be found within all of the Ninestars' trash garbage can ranges. 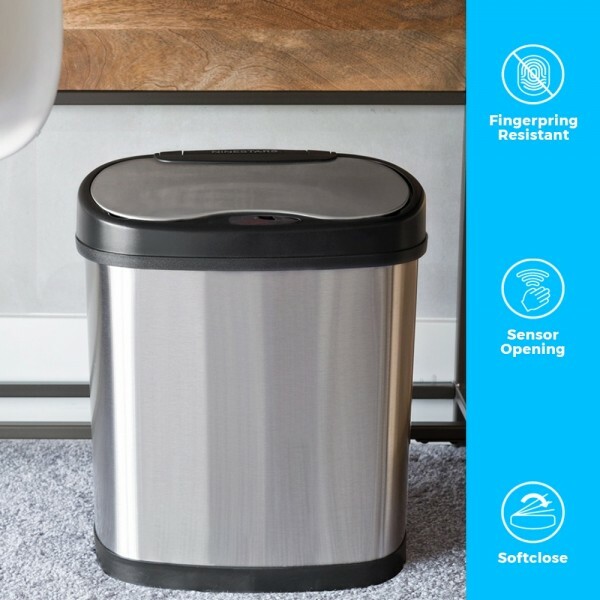 Now, how does this amazing bin work and why does it make everything easier and smarter? Well, thanks to its cutting-edge technology, as your hand approaches the lid, it will immediately open automatically and smoothly without causing any annoying or snappy sounds. Some people are afraid of these fancy bathroom bins because they tend to think that, as the sensor must be programmed to open for only a couple of seconds, the lid will all of a sudden close without warning, causing mess and spillage. However, as long as you are present beside the bin and there is motion detected, the lid will stay completely open as the motion sensor will 'know' that you are within the range which will mean that you're not finished disposing of the waste. Now, rest assured that it won't stay open forever because three seconds after you walk away from the lid, it will automatically close. This fantastic process last for 10,000 cycles before you need to replace the batteries! Furthermore, the new design now is supplied with an inner ringer bag holder that allows you to use any bin bag of your choice, at the same time allowing easy bag change, preventing the bag drop and hiding that ugly bin bag hangover. The bin lid offers a wide opening allowing mouth for easy waste disposal. Welcome to the new generation of the sensor bins for 2018/2019, where the wastebin now looks good, practical & ooze’s with quality. Features •	Premium Quality Stainless Silver Steel that’s fingerprint & smudge proof Body. Now the new oval plus series offers the same brushed satin steel lid finish for that sophisticated look. •	The handsfree operation, which is a touchless process of disposing of household rubbish without the need of touching the bin lid. Anti-skid base keeps the wastebin sturdy in place. •	Completely seals unpleasant odors and helps to prevent cross-contamination due to its touch-free and soft, silent close. •	The unit uses 2 x C size batteries; Battery life is now extended thanks to its energy-efficient technology ensures a 20% longer battery life that now extends up to 18 months before a change. •	Includes a high-grade ABS plastic bag retaining ring ultimately keeps the bag out of view, preventing bag drop and use of any standard bin liner.